About Change is a series of exhibitions curated by Félix Angel that focus on contemporary art in Latin America and the Caribbean. 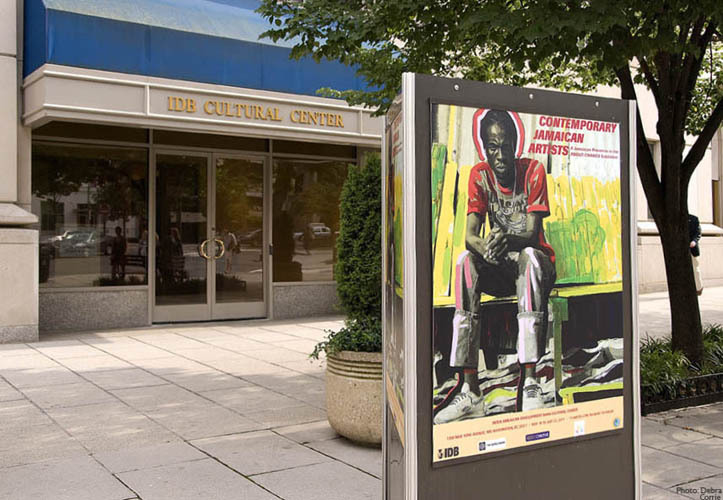 As part of that series, Contemporary Jamaican Artists opened at the Inter-American Development Bank's Cultural Center in Washington this week. The exhibition features nine artists including Charles Campbell, Margaret Chen, Laura Facey, Gerard Hanson, Marlon James, Michael Parchment, Ebony G. Patterson, Oneika Russell and Phillip Thomas; an ecclectic group of multi-media artists, whose works speaks to that same diversity. Each is represented by recently acclaimed pieces and through this tight selection, visitors glean some of the distinctive themes occupying Jamaican artists now, such as slavery and the middle passage in Campbell's Oceans (2005) and Facey's Their Spirits Gone Before Them (2006) and Russell's video Porthole (2008) or popular culture reflected in Hanson's Gun Salute (2009), Marlon's tattooed Stefan (2010), Patterson's Entourage (2010). More subtle are Chen's Cross Section of Ark 1999 and Thomas's Carousel (2009); the first reflecting the inward journeys that have preoccupied many female artists since the 1980s while Thomas's more extrovert and beautifully rendered Carousel (2009), offers a satirical view of life in the island that is a never ending round of drama and slippage. Collectively, the About Change series of exhibitions demonstrates that art in Jamaica as elsewhere in the region, appears to be shifting in focus and style to reflect a more acute sense of social awareness and activism.